Myanmar, Namibia, Nepal, Pakistan, Palestine, on and on the flag-bearers kept coming in an mesmerisingly vibrant and uplifting display of youth, positivity and national pride. There was enough energy in the room to power a generation - and that was absolutely no coincidence. This is the whole point of the One Young World summit, which opened last night at the National Convention Centre in Dublin. Admittedly the moment when the giant Irish tricolour was hustled down the crowd, tying people up in knots along the way, could have gone a little more smoothly - but it was all part of an enticingly giddy feel-good factor. Key figureheads, including four Latin American presidents, UN Special Envoy for Climate Change Mary Robinson, Bob Geldof, Boris Becker and Ali Hewson, among many others sitting on stage, were certainly beaming broadly through it all. Pithily described by co-founder David Jones as "a catalyst for change in the world", the summit aims to inspire the leaders of tomorrow from all around the world among the young people from 180 countries who have gathered together to discuss problems and solutions over the coming three days. Taoiseach Enda Kenny, in a keynote address, told the summit that Ireland's economic recovery "was and remains a democratic privilege, a national obligation". And the recovery was "the people's recovery", he insisted, saying it had been delivered through "sacrifice, often cruel sacrifice". However he said the unemployment figures among our young people was "intolerable". "To you, as young leaders, I reprise what I told the European Parliament: that the unemployment figure amongst our young people is intolerable. Tennis star Boris Becker attends the opening ceremony of the One Young World Summit. Barbara Lindberg. One Young World is unique in giving its delegates and Ambassadors, from over 190 countries, the opportunity to interact directly with some of the world’s leaders. 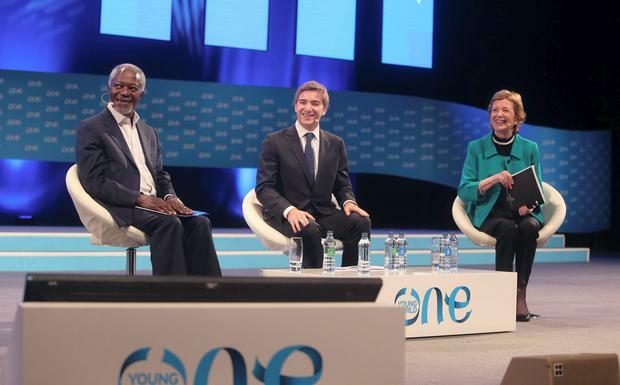 Delegates will engage in discussions with the former UN Secretary General, Kofi Annan; former President Mary Robinson; Sir Bob Geldof, and many more, debating issues and formalising solutions for the pressing issues the world faces. A key theme for this year’s Summit will be Peace and Conflict Resolution – using Ireland’s legacy and relatively recent reconciliation as an example to guide discussion. Conor McCabe Photography. Bob Geldof gives the keynote address during the opening ceremony of the One Young World Summit at the Convention Centre Dublin in Dublin, Ireland. Barbara Lindberg. Pictured on main stage of the opening night of One Young World was flag bearers. One Young World is a not-for-profit organisation that connects and guides young leaders from around the world who are driving real change in their countries, communities and companies. Conor McCabe Photography. "As leaders, we must not allow a generation to grow up believing that democracy itself has failed to give them a reasonable chance in life. Because it is they who are democracy's future, Europe's tomorrow, our Union's hope." Meanwhile, he talked of the importance of environmental initiatives and sustainable living, saying: "Because if we do not, then for our children and grandchildren, it won't be a question of how they will live in a world of nine billion people. But rather one of whether they will be living at all." The conference was opened by host Ryan Tubridy and addressed by Bob Coggins and Clara Kelleher, who brought the global event to Dublin. International delegates included Moraa Osoro (24) from Kenya, sent over to the One Young World conference by her employers, Unilever. "I've already met so many amazing people with brilliant ideas," she said. Jutatip Talumassawat (23), a teacher from Thailand, had already found a friend in student Amna Alowaisi (25) from Dubai. Both already have plans for world-changing projects in their countries, they revealed. Delegates were entertained by the sweet singing of Ballymun Children's Choir. One Young World Counsellor, former Irish President Mary Robinson, gave an impassioned speech on climate change, saying we need brave and transformative leadership. "At the moment we are not on course," she said. She said the next 15 months will see exciting global goals being set, with September 2015 seeing sustainable development goals set for all countries and in December 2015, ambitious and legally-binding agreements reached on climate change. She finished with a quote from Seamus Heaney's 'From The Republic of Conscience', urging delegates to leave the One Young World event as ambassadors of conscience and to do "all kinds of things." Ian Mallon, Acting Editor of the Irish Independent and a member of the One Young World Advisory Board, said it was a "great pleasure" to see such a great global event coming to Dublin. INM is the media partner of the summit. Bob Geldof told delegates that he had a sense of grim foreboding about the state of the world and felt something terrible was about to happen. And he revealed how he had sat down with his aunt Fifi in Mount Merrion in Dublin three years ago when she was aged 103 and asked her if there had been a sense that something bad was going to happen before the First World War. She said she had no memory that anything was any different. He criticised Russian President Vladimir Putin for the events happening in Ukraine after telling delegates that you cannot be a leader if you are a thug or a bully. The One World Founder David Jones was more forgiving, "you can be a banker in your day job, if by night you have a soup kitchen going on".